Event Calendar: A custom home page event calendar to showcase your upcoming events in a neat tabber, navigated by month or event sequence. Buttons to add the calendar directly to your Google Calendar, Microsoft Outlook or Apple iCal, and a button to link to your booking form for the event if applicable. Featured Posts Scroller: This could either be used to showcase highlights of past events, or notable blog posts. This Js scroller is tag and can be set to automatically scroll through slides. 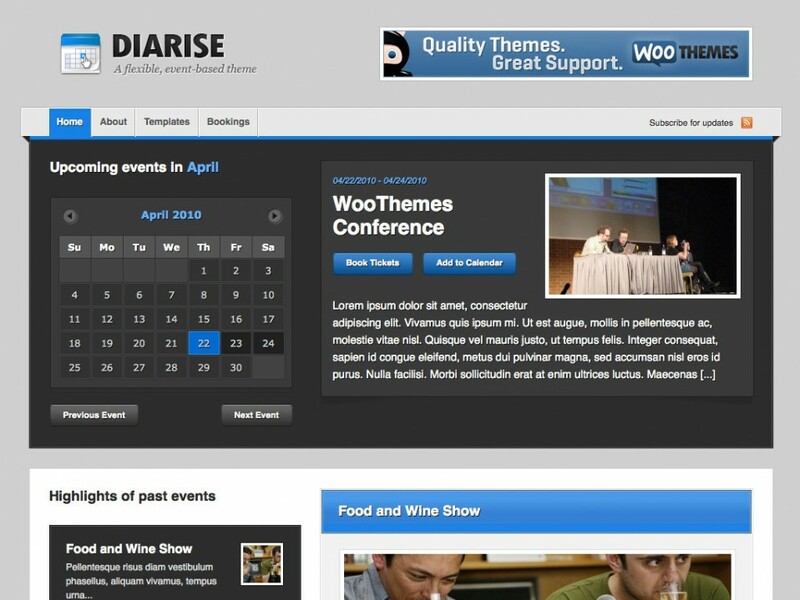 A Completely Modular Home Page: The Diarise home page can be set to show the Event Calendar, Featured Posts Scroller, Blog Section and Widgetized Footer or any combination of these. Modules can easily be disabled via the theme options. Custom Widgets: There are 9 Custom Woo Widgets for use in the widgetized sidebar and footer: Customer Feedback, Twitter, Recent Blog Posts, Featured Media, Blog Information, Ads & Search to name some of them. Alternative Styles: 8 delicious colour schemes to choose from, and possible to change color of links and buttons in options panel.